UKIP has been ordered to pay £175,000 in legal costs over a defamation case brought by three South Yorkshire Labour MPs. 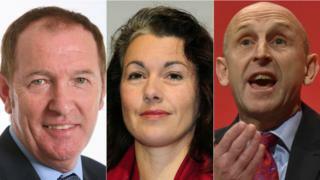 The party was told to pay towards costs incurred by Rotherham MPs Sir Kevin Barron, John Healey and Sarah Champion. Jane Collins, MEP for Yorkshire and North Lincolnshire, had made remarks about Rotherham's child abuse scandal. She was ordered to give £54,000 to each MP in February 2017, but did not pay. The interim payment order comes days after the party's leader, Gerard Batten, issued a plea for cash for the party, saying £100,000 must be raised by the end of March. A hearing in February ruled that UKIP took a "deliberate, informed and calculated" decision to ensure the defamation action brought by the three MPs against Ms Collins should not be settled before the 2015 general election. UKIP now have 14 days to make the £175,000 payment, ordered by Justice Warby at the High Court. A joint statement from the Labour MPs said: "UKIP's actions behind the scenes forced the costs of this case to soar and compounded the damage from Jane Collins' unfounded and hurtful allegations. "This deliberate strategy hugely increased the legal costs and it is right that UKIP are today held liable for a large share of these costs. "UKIP used the unfounded allegations by Jane Collins for political advantage." The three MPs said UKIP leaders knew Ms Collins' case was "hopeless" but nevertheless blocked settlement in their favour because they believed it would win them votes. Sir Kevin is Labour MP for Rother Valley, Ms Champion is Rotherham MP and Mr Healey represents the Wentworth and Dearne constituency.